I’m excited about this, and figured today would be a great day to talk about it! I haven’t had a Free Shirt Wednesday post in a while, so I thought talk about the new shirts today. A couple of weeks ago, I was brainstorming some ideas for a shirt, possibly a series for the site. Something a little fun. I drew up a crappy sketch and had a EffectsBay.com friend (Sonny Hancock) turn the idea into something usable. 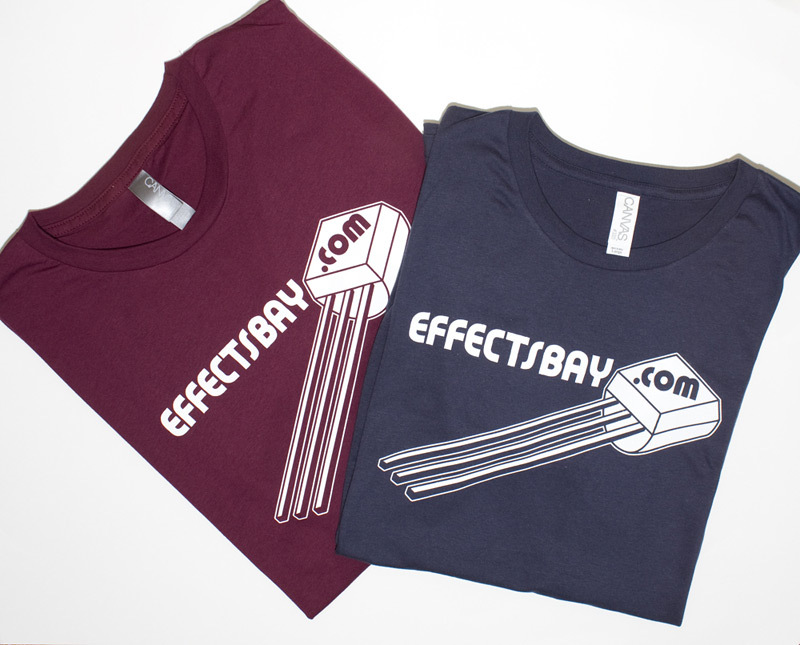 In the end, it’s the official ‘transistor’ EffectsBay.com shirt. Didn’t want a pedal on it. No rock flames or skulls. Wanted to go a little deeper. Little nerdier. I had a short run of this printed, and I just picked them up from the printers yesterday. I’m super stoked on how they turned out. I have them available in royal blue (white ink) and maroon (white ink). I’ll be giving a few of these away down the road, and will probably get a few more printed. If any of you are interested in wearing a big transistor on your chest (it’ll impress the ladies.. trust me), shoot me a email. I’ll be selling them for $14.99 + $5.00 shipping. International orders.. we’ll need to work out some type of shipping cost. Sizes are M, L and XL.